Looking for a fishing kayak? Fishing out of a kayak has grown significantly in popularity over the past few years and there are many reasons why. To start, fishing out of a kayak is much easier than one would think and you can easily have all of the same amenities in a kayak as you would have with a boat. 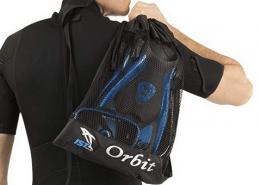 There is a surprisingly large amounts of storage space and many features that can be fitted onto a kayak that makes its extremely user friendly and easy to use such as fishing rod holders and tackle fishing backpack storage areas. They make things such as kayak fish finders and kayak trolling motors which makes fishing out of a kayak a real pleasure. Another great benefit to fishing with a kayak is the fact that they are small and easy to transport from location to location regardless the type of vehicle being used. Unless of course you try to transport your kayak with a motorcycle, that might be challenging. This allows the angler to move from location to location with ease so you have the ability to fish in multiple locations, even in the same day. We’ll be going over some of the great benefits you can expect to get from fishing with a kayak so you’ll no longer need to ask questions like, “What is the best value fishing kayak?”, “What is the best bass fishing kayak?” or “What is the best cheap fishing kayak?” Here are our top 5 picks for the best best kayaks for fishing in 2019. This fishing kayak is designed around precision and performance. If you’re an angler looking for a serious kayak that will enable you to spend countless hours on the water, then look no further. Perception has done a complete overhaul of their Pescador line meaning they’ve done more than just added a new paint job. The beloved Pescador series is known to be some of the best kayaks currently on the market but that didn’t stop Perception from making it even better, they make one of the best kayak for fishing currently on the market. This kayak is made for real anglers and has been outfitted with countless features to help the angler effortlessly and effectively fish out of it. Some of the features include a completely removable stadium seat that also allows for two different seating positions, whether you decide to have it upright or reclined, the choice is yours. Rigging and storage were not left out of the equation; the opportunities are plentiful with this kayaks bow and rear tank wells. The bow tank well has even been outfitted with the mesh cover. 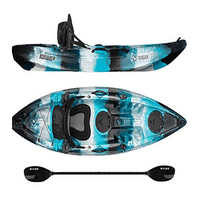 Some other luxuries you will receive with this kayak include its recessed tackle box storage, a center console which is ideal for rigging your fish finder electronics and multiple molded-in fishing rod holders. 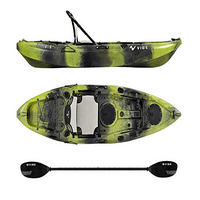 This beautiful fishing kayak comes in at 12 feet in length and 32 ½ inches wide. 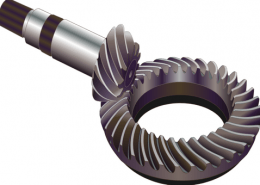 It’s made out of very strong and long-lasting Polyethylene and it weighs in at only 64 pounds. When it comes to fishing kayaks, this one is no slouch. If you’re on the market for one of the top fishing kayaks currently available, then you need not look any further. If you’re looking for a robust fishing kayak then the Yellowfin 100 might just be the right choice for you. This fishing kayak is short and stout but boy does it pack a punch. If you’re looking for a kayak that was specifically designed around giving the angler an ideal platform in which to fish from, then this kayak is for you. This 10 foot, 57 pound fishing kayak is equipped with a Hero Seat which are arguably some of the nicest seats that a kayak can be outfitted with. 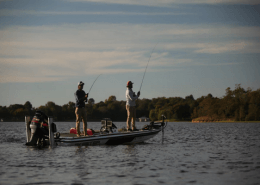 You’ll also find four flush mounted and capped rod holders which easily allow the angler storage of multiple rods while moving from place to place. It has adjustable foot rests allowing for maximize comfort and customization. 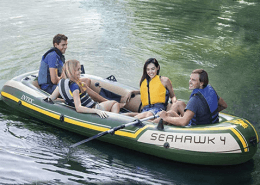 You’ll also find that this kayak is outfitted with four easy grip handles making this extremely easy to maneuver, lift and transport from location to location. There are multiple storage options which include (2) 9 inch hatches with bag inserts, a large rear tank well ideal for fish finder equipment and two tackle tray holders which perfectly fit PLANO’s 3600 series tackle trays. If you’re looking for a kayak that is robust and built for the single-purpose of allowing the angler to have the absolute best opportunity while on the water, then the Vibe Yellowfin 100 is the kayak for you. This fishing kayak is hands down one of the sleekest looking fishing kayaks currently on the market. This one person kayak comes in at 9 feet in length and weighs in at only 46 pounds. It’s outfitted with a Deluxe kayak seat which has been said to allow for maximum portability and stability in a smaller package. You’ll find there are five flush mounted rod holders which are ideal for outfitting with Scotty, Vibe and RAM mount accessories or simply holding your extra rods. If you’re like many anglers then you’ll often times realize too late that your paddle has gone over. This is not a problem with the Skipjack 90. You won’t find just one, but two paddle parks ensuring that your paddle is secure and on board at all times while not in use. This kayak is equipped with three sealed hatches which each incorporate a bag insert as well as a large rear tank which is ideal for storing and protecting all of your fishing kayak necessities. The Skipjack 90 also has five easy grip carrying handles making it extremely effortless to move from location to location and transport whenever necessary, this is also one of the most stable fishing kayaks currently available. If you’re looking for a kayak that is small, slender and ready to hit the water then this kayak is the kayak you’ve been looking for. This rugged fishing kayak is made out of high density Polyethylene which has been UV-stabilized so you no longer need to worry about your fishing kayak fading over time. 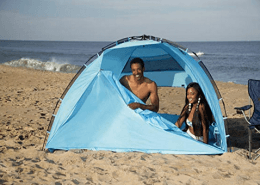 This means this fishing kayak can be left out in the sun for long duration’s of time without need for concern for any long term fading or negative effects due to the sun’s UV exposure. The seating area is large and roomy making it ideal for those long days out on the water. The foot well is graduated making it perfect for people of all sizes due to the fact that they can easily place their feet in the most comfortable and appropriate position. 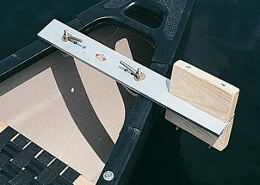 This kayak has a molded-in paddle holder so you don’t need to worry about losing your paddle while you’re not using it. This is a great feature to have on a fishing kayak because you can easily lose track of your paddle while fishing and before you know it, it’s drifting away. You’ll find that it has also been outfitted with carrying handles. This makes it very easy for you to move it from place to place as well as load and unload it once you’ve arrived at your desired fishing spot with this good cheap fishing kayak. We almost forgot to mention that this kayak is extremely lightweight, coming in at right around 40 pounds, meaning it is ideal for for just about everyone and easy for them to move as well. If you’re looking for a kayak that tracks with ease and paddles smoothly then this fishing kayak might be the right pick for you. If you’re looking for a lightweight, easy to move fishing kayak then this is the one for you. 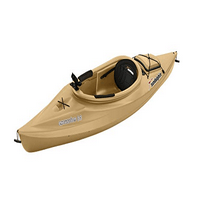 This kayak is ideal for fishing lakes, streams, rivers and getting to those hard to reach excluded fishing spots. 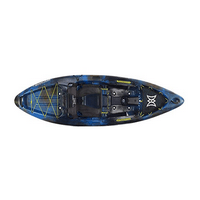 This kayak offers maximum stability at all times while also tracking and paddling with ease. Like all Sun Dolphin kayaks, this one is equipped with UV stabilized Fortiflex high density Polyethylene. 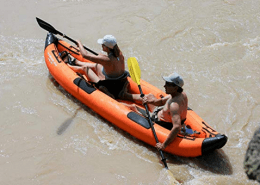 This is hands down on of the most important things that need to be taken into consideration when purchasing a kayak, is whether or not it can withstand the elements. As this kayak certainly can. 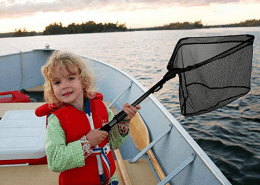 It has two flush mounted rod holders and another rod holder that swivels making it perfect for a “set it and forget it” rod. 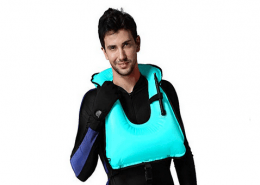 You’ll also find that this fishing kayak large open sitting area, a generously sized storage compartment, a water bottle holder, adjustable foot braces and protective thigh pads not to mention this is one of the lightest fishing kayaks. 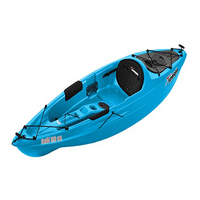 This fishing kayak is ideal for beginners and seasoned anglers alike. If you’re looking for a kayak that will last you years to come, this kayak is the right kayak for you. We hope our fishing kayak reviews helped you to make the right decision in regards to which fishing kayak is the right pick for you.